Peppa Pig: First Science Ladybird A hands-on activity book introducing science to young children! Join Peppa and her friends as Daddy Pig teaches them the basics of science. 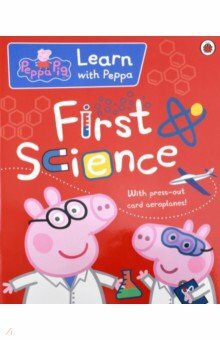 Peppa Pig: First Science A hands-on activity book introducing science to young children! Join Peppa and her friends as Daddy Pig teaches them the basics of science. Аннотация к книге "Peppa Pig: First Science"
A hands-on activity book introducing science to young children! Join Peppa and her friends as Daddy Pig teaches them the basics of science. –20 % Выгода 75 ₽ Peppa Pig: Well Done, Peppa! - Chart Sticker Book 1 рец. –27 % Выгода 214 ₽ Peppa Pigg. Beep, beep, brrrm! (sound board book) 2 рец. –27 % Выгода 167 ₽ Peppa Pig: Night Creatures (lift-the-flap boardbook) 1 рец. –20 % Выгода 75 ₽ Peppa Pig. Peppa Goes Swimming (Sticker Story Book) 1 рец. –20 % Выгода 75 ₽ Peppa Pig. Peppa's London Day Out Sticker Activity 1 рец. Похожие на "Peppa Pig: First Science"
–27 % Выгода 101 ₽ Peppa Pig: Mummy and Me Sticker Colouring Book 2 рец. –20 % Выгода 143 ₽ Doodle with Peppa 1 рец. –20 % Выгода 108 ₽ Peppa Dress-Up. Sticker Book 3 рец. –20 % Выгода 124 ₽ The Big Tale of Little Peppa 1 рец. –20 % Выгода 178 ₽ The Story of the Vikings Sticker Book 1 рец. Если вы обнаружили ошибку в описании книги "Peppa Pig: First Science", пишите об этом в сообщении об ошибке. Спасибо!